Sam Haynes is a spooky music machine. In this year alone, he has created and released three albums: Ghost Stories, the limited edition Halloween Music (as noted earlier in the countdown) and Spine Chillers. He’s probably putting the finishing touches on another project as you read this! So I had better hurry up and get this review of Spine Chillers finished as quickly as possible. A soft moody opening gradually builds up “Death comes creeping in,” which leads to gong strikes and creepy musical stings. The musical moans are a great touch and its use of heavy tones creates a sense of pursuit. If a monster leaps out and chases people in your haunt, this is the track for you. “HeXed” starts with a very soft harpsichord feel and then a heavy dance beat suddenly shows up. This has a definite Sam Haynes feel and the numerous little spooky touches layered in make it equally at home in a party music mix or haunted attraction. “Masks” compliments its slow, soft build with creepy electro touches and violins. In addition to the whispering winds and wordless female vocals, there’s a sense of things creeping and slinking in the dark. I think this lets it work in many kinds of haunt scenes, but I think something involving spiders or insects would be the most popular one. 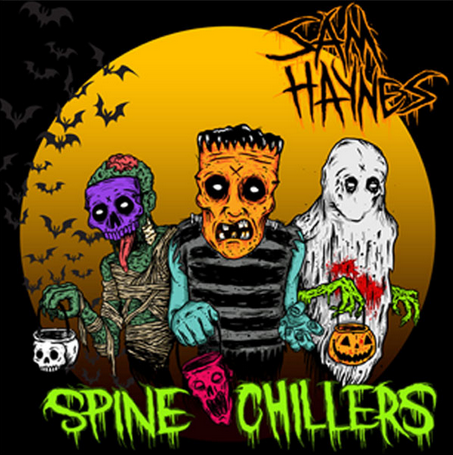 The titular “Spine Chillers” offers a pounding opening and constant feel of unease, along with some fantastic piano work coupled with gongs and strings Music box chimes open “Grim Reaper,” but are joined by an electro dance beat joins in. It even sounds like dubstep at times! Not only is this like the opening theme to a horror movie, but it would work wonders in your haunt’s waiting area. It keeps the energy (and anticipation) up while still reinforcing idea of scary things to come. “Halloween Twilight” could be my favorite track on the album. I love the scary opening, along with the moanlike music and eerie tones. An otherworldly feel starts off “Night Caller.” Wordless male vocals join wordless female vocals, along with constant pounding tones and electro touches as well. The brief harpsichord-like tones are also a nice addition. Using this in a dark maze could be fun! Just as its title implies, “Sinister Lullaby” is soothing and unsettling at the same time thanks to its chiming music box feel. It’s obviously great for use in scenes involving creepy dolls or a haunted child’s room. As the name implies, “Cemetery Gates (remix)” is a remix of a Sam Haynes track from another album. But the original was not from a Sam Haynes album, but appeared on this year’s free Graveyard Calling compilation Monsters Unplugged. I told you the guy was a machine! The remix has a wonderfully atmospheric opening thanks to the mix of storm effects, flapping wings and a crow cawing. The spooky piano and mournful strings add to the mood, but develops a (somewhat) lighter tone as time goes on. I envision this being played in a graveyard or haunted forest scene. Moans and wails form a unique musical mix in “Spirit of Halloween” and then spooky music takes over. It’s good for any ghostly scene or séance. If you are performing an interactive séance, play this with volume extra low and slowly turn it up as track plays (and the “spirits” start to make themselves known). “Pandemonium Carnival” offers spooky circus music, Sam Haynes style. There’s an electro buildup and soft spooky circus music, then the drums kick in and everything picks up. I also like how it mixes a circus march and merry-go-round music. Rather than give an example of the usual clown room, I want to pitch a new idea to you: Have guests enter a room which includes a small model of a carousel. A model which later starts mysteriously rotating and playing this track while a hidden actor prepares to scare them. Night of the Living Dead samples abound in “Night of the Ghouls,” which offers a spooky pounding beat and heavy electro touches. Why use the word “ghouls” instead of “zombies?” Because that’s what the creatures in the movie were called in the script! It was the general public who decided the revived corpses were zombies and Romero’s depiction quickly became the law of the land. Only for many people to decide the infected people in 28 Days Later were zombies years later and sparked a debate over whether these fast-moving creatures actually counted as such because they didn’t match the Romero version of zombies! “Pumpkin Carver” has moaning and eerie touches aplenty. The soft piano work adds to the frightening feel the music creates. Since the title suggests one, a haunt scene using this track could be themed around a pumpkin carver. Imagine a static figure of a knife-wielding scarecrow surrounded by glowing Jack O’Lanterns. Just make sure the scare doesn’t involve the carver, because that’s what people would normally expect. “Hex (soundtrack mix)” is the track “HeXed” minus the “dance” parts. The harpsichord-like spooky music and wordless female vocals give it a mysterious and eerie feel. “Just before dawn” starts with crackly sample, but it is the wordless female vocals and dark tones which set its soft and creepy feel. It’s perfect for just about any scary scene. “Silent Kill – Stories of the dead (Sam Haynes remix)” is a collaboration with Silent Kill and you can download the original version for free here. With its soft spooky opening and piano work, it’s practically like a new song! Marching drums play a big part in this track as well. It’s a more subdued and atmospheric take on the original with some sound effects thrown in for good measure. Continuing with the remixes, “The Other Side (remix)” is a new take on a selection from Ghost Stories. Its spooky opening vaguely reminds me of an 80’s slasher movie, but then plants itself firmly in dance territory. “Halloween Night (Extended remix)” is the last of the remixes, this time derived from Welcome to the Horror Show. It’s sure to please fans of the original while still offering something new. Spooky piano work and old school ghostly wails are the stars in “A Haunted House Party.” Speaking of stars, a sample of Vincent Price from House on Haunted Hill leads us to dance music and chiming. “Night of the Ghouls (No Zombies version)” is just what you expect: The previously heard track with all the samples removed. Given the number of remixes on display, it’s a nice way to close things out. With Spine Chillers, Sam Haynes has once again knocked it out of the park. This is even more impressive when you factor in the way he has been pumping out album after album this year without a single dud. All of the tracks can be looped nicely and I personally think its mix of dance and horror gives it more leeway for use while handing out candy on Halloween. When you factor in the amazing cover art by Kachenstein, it’s a perfect purchase to aid your haunted house or Halloween party. It’s a sure thing we’ll be seeing more of Sam Haynes’ work at Gravedigger’s Local 16 in the future. And knowing Sam Haynes, that could be the very near future! Special thanks to Sam Haynes for the review copy!